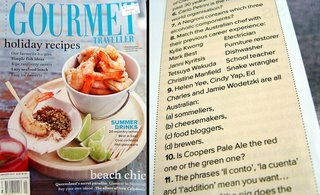 It was this comment by Anna that saw me flicking through the latest issue of Australian Gourmet Traveller in the newsagency this morning. And there, on page 18, as Anna promised, was my latest claim to fame. It's been derived from our interview in their article of course, but it's still a surreal sight to behold. It's been an exciting end to the year. 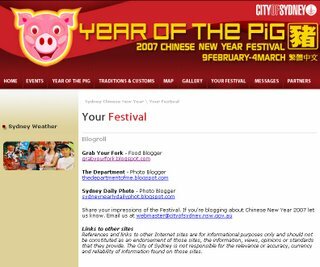 Last month I was asked to be included on the blogroll for the City of Sydney's Chinese New Year 2007 website. 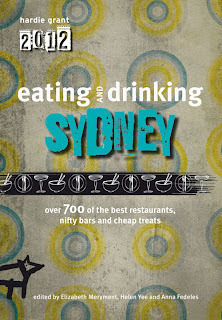 Apparently GrabYourFork "provide[s] readers with an intimate and personal view of Sydney culture", according to the email sent by their web services team. And finally, GrabYourFork is now being officially archived by PANDORA, the web archive set up by the National Library of Australia. "The National Library and its partners do not attempt to collect all Australian online publications and web sites, but select those that they consider are of significance and to have long-term research value." So GrabYourFork has been catalogued and added to the National Bibliographic Database (a database of catalogue records shared by over 1,100 Australian libraries) and the National Library online catalogue. Actually I'm just ecstatic this means I no longer have to worry about backing-up my website. It's gonna be preserved forever by the Library which "will take the necessary preservation action to keep your publication accessible as hardware and software changes over time". Woohoo! Congratulations on your recent achievements! Definitely well deserved. GYF is still my favourite Aussie Blog. Ooh congrats, especially regarding Pandora! 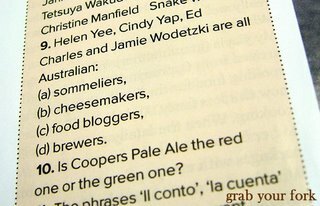 Nothing evokes Sydney better than your blog. Well done Helen. This recognition is well-deserved. 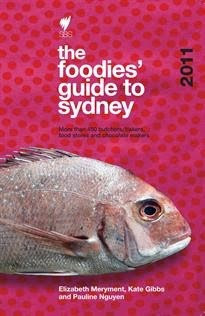 You are my favourite Sydney food blog; I have used your recipes and taken your recommendations for eating out. Blog on! Helen - happy new year and many, MANY congratulations. So many accolades in one post, it must be hard to know which one to be most excited about! It's obviously been a great year for Grab Your Fork and well done to you. Nice one. 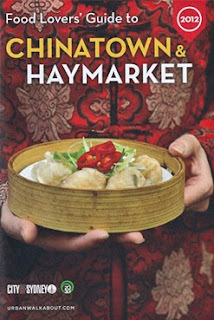 Time to start planning our year of the pig feast! Congratulations! That is great news! Thanks for all the hard work in feeding us with your well written and drool worthy posts! Big congratulations Helen! It's great to see your hard work so widely recognised. Your famous now Helen! Congratulations!! All your great work has finally paid off. Hope 2007 brings you more success and luck. Oh wow! The archival thing is a biggie, I hope that you've gone out an celebrated with a meal worthy of elastic waisted pants :D Congratulations, things will only get bigger & better for you! Im always referring to your blog when im thinking of where to go out for dinner, you are truly getting the recognition you deserve. Congratulations,you put so much effort on this website. Congrats on the well deserved recognition Helen. Keep up the good work. Although I really don't know how you find the time, I haven't visited for a while and its taken me half the night just to catch up on the old posts!! Hi Simon - Thanks. Trust me, I will be! Hi Y - So we're a bunch of gluttons? lol. Yeah, probably! Hi Sue - Thanks. You would think that eating would be its own reward, but lol, it's great sharing it all and getting so much positive feedback. Hi m-h - Aww thanks. I'm so chuffed you utilise this site with such fervour :) And blog on? Definitely! Hi Veruca - Oink! Oink! Bring it on! Hi Kelly - Thank you. It's always a surprise to uncover who's reading it! Thanks for all your comments throughout. Hi Food Hog - Perhaps not famous but ha, I'll take it. Thank you and here's to a successfuly and rewarding 2007 to you too. Hi Yvo - Thank you and happy new to you too! Hi Y - lol. I didn't go out and celebrate specifically, although in hindsight my calorific intake lately has been in the celebratory "bandwidth" funnily enough! Hi Chocolatesuze - Thanks. I've been gorging on plenty lately! Hi MissK - Thanks. 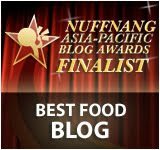 The eating part is lots of fun :) and it's really heartwarming to see so many regular readers and comments! It makes me appreciate everyone else's efforts too. Hi Jen - Thank you. Me too. Year of the Pig? What a year! Hi Kirsten - Thanks. It's funny how time is elastic when you're having fun! It's been great. 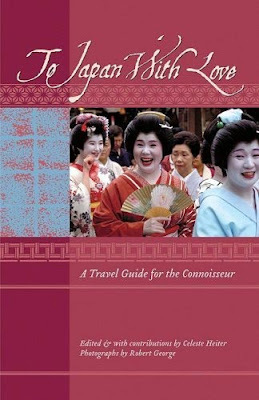 Thanks for reading GYF throughout. WEll I for one am not at all surprised! Great work always deserves recognition and you thoroughly deserve it. I reckon you should treat yourself to blogging a three-hatter!